Sherlock Holmes is a fictional Private Detective (or, Consulting Detective, the term he preferred), an analytical genius with generally unrivaled deductive powers (and a complete lack of social skills ). The original version lived in Victorian London, at 221B Baker Street. Holmes was assisted by his trusty Sidekick, Doctor John Watson. Watson also served as the Narrator: all of Holmes's adventures were (with a few exceptions) told via the Framing Device of Watson's journals, ably edited for publication by Sir Arthur Conan Doyle. Holmes had a number of well-known catch phrases: "When you have eliminated the impossible, whatever remains, however improbable, must be the truth", "The game's afoot" (itself a quote from Shakespeare's Henry V), "The Plot Thickens", and, most famously, "Elementary, my dear Watson" (which Holmes never actually said in any of Doyle's stories). A less known Catch Phrase would be "It is simplicity in itself," which appears to be the basis for "Elementary, my dear Watson." Throughout the stories only one person ever refers to Holmes as "Sherlock", and that's his brother. Nearly everyone else, even Watson, calls him "Holmes" or "Mister Holmes". This is normal for Victorian and Edwardian England; at the time, you'd only use a first name to address family members, romantic partners (and you had to be all but engaged), junior servants, or children. One minor character in "The Sign of Four" refers to him as "Mister Sherlock", which in context implied that he'd known Holmes since boyhood. Additionally, this is updated and played with in the 2011 Ritchie sequel, where Mycroft calls his brother "Sherly" on a number of occasions. In the modern US, however, the rules are very different; the only people you're not supposed to be on a first-name basis with are seniors whom you don't know well, and in fact refusing to use first names can paint you as a snobbish, sneering Jerkass. As a result, a hundred years after his death and on the far side of an ocean, the Great Detective is referred to by his first name far more often than he was in his "lifetime". Holmes fans in Britain are called "Holmesians", in America "Sherlockians". Inspector Lestrade of Scotland Yard. Initially he was mildly antagonistic as he disapproved of Holmes's interference in police matters, but he later came to respect and rely on the detective. Holmes would usually allow -- or insist -- that Lestrade take full credit for cases that Holmes had solved. Mycroft Holmes, Sherlock's Aloof Big Brother. Mycroft's role varied from time to time, but he was generally Always Someone Better to Holmes. Even Sherlock acknowledged that Mycroft's mind was sharper than his own, but his skills were largely wasted due to his exceptional sloth: almost nothing piqued Mycroft's interest enough to lure him out of the familiar surroundings of his favorite private club. Mycroft was some sort of government functionary, whose official duties were limited, but "In certain cases, Mycroft is the British Government." Professor James Moriarty, Holmes's personal Evil Counterpart; a mathematician and criminal mastermind whom Holmes described as "the Napoleon of Crime". Moriarty was killed (as, apparently, was Holmes, though he turned out to be Not Quite Dead) in "The Final Problem", his introductory story, though Conan Doyle went on to reuse Moriarty in The Valley of Fear, a novel whose action takes place before that of "The Final Problem." Moriarty's henchman, Colonel Sebastian Moran, is the villain of The Adventure of the Empty House and has been used in many post-Doyle Holmes stories. Mrs. Hudson, Holmes's disapproving landlady. Mary Watson (nee Morstan), Watson's fiancee and later wife. The Baker Street Irregulars, a gang of street children who gather information for Holmes. See Sherlock Holmes (novel) for a list of canonical Sherlock Holmes works written by Arthur Conan Doyle and the associated tropes. Sherlock Hound, an Anime adaptation that recast the characters as Funny Animals and aired in 1984 and 1985. Sherlock Holmes in the 22nd Century, a 1999 Animated Adaptation of Holmes Recycled in Space! A common urban legend is that the fact that Sherlock Holmes fanfics are so common made the writers of Star Trek: The Next Generation believe the character, as well as his nemesis Professor Moriarty, were in the public domain when they made the episode "Elementary, My Dear Data", only to receive an angry letter from the Doyle estate. This is, unfortunately, not supported by the facts, but it makes a good story -- students of urban legends will, of course, recognize some slight resemblance between this and the Neiman-Marcus Red Velvet Cake legend. Sherlock Holmes was arguably one of the first franchises in the modern era to become almost as famous for its fanfiction as for its fiction. Holmes captured the imagination of many writers, and spawned a considerable amount of unauthorized sequels or guest appearances -- especially across the Atlantic, as the state of international copyright enforcement was largely nonexistent at the time. According to Victorian-literature expert Jess Nevins, it was fairly common for penny-dreadful writers to write stories in which Sherlock Holmes is immediately murdered and a plucky young protagonist has to figure out who did it. Also, stories of the French character Arsène Lupin began as a Holmes copycat, but subsequently featured a renamed (by order of Conan Doyle's lawyers) and badly-written version of Holmes himself. Basil Rathbone and Nigel Bruce starred as Holmes and Watson in a popular series of film adaptations in the 1930s and 1940s; the last two were anachronistically set in the then present-day era, pitting Holmes and Watson against Nazi spies. Bruce's portrayal of Watson as a bumbling incompetent rather than the original ladykilling man of action helped begin a long chain of similar Adaptation Decay. In the 1937 German comedy adventure Der Mann, der Sherlock Holmes war (The Man Who Was Sherlock Holmes), two unsuccessful private detectives (Hans Albers and Heinz Rühmann) decide to drum up interest by dressing up as Holmes and Watson. They are met with great deference everywhere, solve the theft of valuable stamps, but are put on trial for impersonation, where they insist that they told everybody that they weren't Holmes and Watson. Conan Doyle is shown laughing his head off in the courtroom audience and mentioning that Holmes and Watson are fictional characters he invented, which means the movie must be set before 1930. The 1970 film The Private Life of Sherlock Holmes, directed by Billy Wilder. In 1975, Gene Wilder made his directorial debut with The Adventure of Sherlock Holmes Smarter Brother. It follows Sherlock's (self-proclaimed) smarter younger brother Siegerson, who attempts to thwart Moriarty on his own. 1978's The Hound of the Baskervilles starring Dudley Moore and Peter Cook is one of the worst films ever made. Available to watch on Netflix Watch Instantly, it is a stunningly bad comedy with the entire soundtrack consisting of Moore idly noodling on a piano. 1979, Murder By Decree starring Christopher Plummer as Holmes and James Mason as (a Non-Flanderized) Watson on Jack the Ripper case. The basis for the plot was the book Jack the Ripper: The Final Solution By Stephen Knight, same book that would be the basis for Alan Moore's From Hell some years later. It was seen by some as a Darker and Edgier Sherlock Holmes movie but, given the subject matter, it's understandable. This was the second time Holmes and the Ripper met, the first time was in the 1966 movie A Study in Terror. In the 1988 movie Without a Clue the Holmes/Watson roles are reversed, with Watson as the real detective and Holmes as an alcoholic actor hired by Watson as his public front. In perhaps the most unusual adaptation, there is the 1971 movie They Might Be Giants (from which the band took its name), which starred George C. Scott as a man who thought he was Sherlock Holmes, and Joanne Woodward as his psychiatrist, whose name was Watson. The film itself took its name from a line in Don Quixote. And a large number of made-for-TV-movies, starring such actors as Tom Baker, Larry Hagman, Roger Moore, Richard Roxbourgh, Ruper Everett, and Matt Frewer. The 1985 Pilot Movie TV movie The Return of Sherlock Holmes had Michael Pennington as the great detective, thawed out in modern times by a female descendant of Watson. 2003 saw an adaptation of The Hound of the Baskervilles which played up Holmes's addiction. Guy Ritchie filmed a Sherlock Holmes movie with Robert Downey, Jr.. as Holmes and Jude Law as Watson, released on Christmas Day 2009. Response to the trailer, which basically strung the comedic moments together to make it look more like a spoof than an actual Holmes story, was... controversial... in fandom. The movie received mostly positive reviews, and critics praised Downey Jr's portrayal as the detective (for which he won a Golden Globe) and the chemistry between him and Law. And it was a box-office hit. A sequel to this film, titled Sherlock Holmes: A Game of Shadows, came to theaters in December 2011 with Jared Harris as Professor Moriarty and Stephen Fry as Mycroft Holmes. The Asylum released Sir Arthur Conan Doyle's Sherlock Holmes directly to DVD in 2010 to piggyback on the Ritchie film. Starring Ben Syder as Holmes and Gareth David-Lloyd as Watson. It's steampunk and involves dinosaurs. Adrian Conan Doyle (son of Arthur Conan Doyle) and John Dickson Carr (Doyle's biographer and friend) wrote a series of Short Stories collected under the name 'The Exploits of Sherlock Holmes', and was supposed to be the accounts of the cases that Watson mentioned but never made it to the original 56 short stories. Some consider it canon, for being written by the Author's son, and treat it as the tenth volume of Sherlock Holmes canon, but many more don't for the obvious fact that it wasn't written or approved by Arthur Conan Doyle (it was written and published after his death) and it was cowritten by an unrelated author. Sequels were expected but never produced, mainly because the authors got in a dispute over who wrote what. Nicholas Meyer's novel (later adapted to film), The Seven Percent Solution proposed that the Moriarty stories were complete fictions invented by Watson to cover for Holmes's recovery from cocaine addiction. (This was to explain the canon's apparent contradiction of Moriarty dying in the story that introduced him, yet figuring in other prequel stories.) In the story, Moriarty is revealed as Holmes's childhood maths tutor, whom Holmes had cast as a criminal in his drug-induced delirium. The story ends with a departing Holmes suggesting that Watson explain his absence to the readers by telling them he'd been murdered by his math tutor. Laurie R. King's Mary Russell series takes place in the 1910s-20s. The Enola Holmes series by Nancy Springer, which depicts the adventures of the much younger sister of Sherlock. This series is a cut above others in that on top of each mystery, the overall plot arc is of the eventual reconciliation of the Holmes siblings as Enola finds that she is a match for her brother in every way for her age. For his part, a spot-on depicted Sherlock learns to admire his brilliant sister as a professional colleague in an utterly believable way. Michael Chabon's 2004 novella The Final Solution, in which Holmes (never named directly, but it is clearly him), a 90ish old man living in country retirement as a beekeeper, tries to locate a German Jewish boy's stolen parrot. In 2010 Andrew Lane wrote Death Cloud, which chronicles a fourteen year-old Holmes's first murder case. It stands to be the only teen novel endorsed by the Doyle Estate. Basil of Baker Street, later adapted by Disney as The Great Mouse Detective. A Funny Animal version of the mythos, and many a child's first exposure to Sherlock Holmes. Basil's name is an obvious Shout-Out to Basil Rathbone. Rathbone himself even has a vocal cameo (albeit one well after his death) as Holmes himself. Sherlock Holmes of Baker Street, a popular tongue-in-cheek "biography" of Sherlock Holmes written in 1962 by W.S. Baring-Gould, has been the source of many interesting theories about Holmes, some of which are often assumed to be canon (even in this very entry). These include the idea that the King of Bohemia was Edward VII; that Sherlock Holmes and Irene Adler became lovers in Montenegro during the time Holmes was hiding from Moran, and that Irene returned to New Jersey to bear his child, a boy later known as Nero Wolfe ; that Holmes in his twenties was a stage actor in a company that toured America; that he worked on the Jack the Ripper case; that Watson had three wives; that Holmes's bee-keeping in later years was intended as a way of producing royal jelly, then thought of as a "fountain of youth"; and that Holmes died in the 1950s after spending the war years - when he would have been roughly 90 years old - fighting Nazis. In The Adventure of Sherlock Holmes Smarter Brother, the title character, Siegerson, is named for Baring-Gould's Holmes pere. As a way of freeing up Sherlock and Mycroft for their various occupations while still ensuring they were members of the "right" class, Baring-Gould invented Sherringford, the eldest--and smartest--brother, who stayed home in Yorkshire to take care of the responsibilities of a country squire. Sherringford was Holmes's original name in Doyle's first draft of A Study in Scarlet. The Hound of the Durbervilles by Kim Newman focuses on Professor Moriarty and his subordinate, Sebastian Moran, as they share a series of adventures that oddly echo Holmes's famous cases and have them meeting numerous other characters from Victorian and Edwardian fiction. The last story in the collection, "The Problem of the Final Adventure", retells "The Final Problem" from Moran's point of view. Trouble in Bugland: A Collection of Inspector Mantis Mysteries is Sherlock Holmes in "Bugland," where everyone is an insect. Holmes is Inspector Mantis, a praying mantis, and Watson is Doctor Hopper. Michael Kurland has written several stories and books in which, as The Other Wiki puts it, "Professor Moriarty is an antihero (and sometimes a real hero) who resignedly tolerates Holmes's obsessively exaggerated opinion of his criminal empire, and is often brought into reluctant alliance with his nemesis in order to counter menaces ranging from threats to their associates to threats to the nation." It's mentioned that Holmes learned much of his observation and deduction from Moriarty, and developed a bad case of Broken Pedestal when he discovered the Professor supplemented his (very small) teaching income with crime. Moriarty's housekeeper, who evidently knew them both back then, feels "young Mister Sherlock" expected his teacher to be a more honest man than anyone could be. Sherlock Holmes first appeared on television in 1937. 1951 saw the first regular TV series based on Holmes' exploits, airing on the BBC with Alan Wheatley as Holmes. A syndicated 1950s TV series, filmed in France, starring Ronald Howard and Marion Crawford. A series of adaptations starring Peter Cushing in the 1960s. Sherlock Holmes and Doctor Watson, a 24-part series from 1979 with Geoffrey Whitehead. Sherlock Holmes, produced by Granada Television (ITV), starring Jeremy Brett, David Burke, and Edward Hardwicke. Ran from 1984 to 1994, and is generally considered to be most faithful to Conan Doyle's original vision of the character. Series one and two ran under then name The Adventures of Sherlock Holmes, three and four The Return of Sherlock Holmes, five The Casebook of Sherlock Holmes, and six The Memoirs of Sherlock Holmes. Five feature length episodes were made and released between series, two based on the novels The Sign of Four and The Hound of the Baskervilles, three based on short stories turned into Adaptation Expansion. The Adventures of Sherlock Holmes and Doctor Watson -- no relationship to the above. A Russian series notable for not flanderizing Watson into an idiot, being a generally faithful Adaptation Distillation and for the fact that the actor playing Holmes got an Order of the British Empire for his portrayal. Murder Rooms: The Dark Origins of Sherlock Holmes is a BBC series which featured not Holmes and Watson, but instead had the young Arthur Conan Doyle himself in the Watson role and expounded on the theory that the character of Holmes was a thinly-veiled stand-in for one of Doyle's medical school teachers, Professor Joseph Bell. Sherlock, a BBC miniseries beginning July 2010. Created by Steven Moffat and Mark Gatiss, the series stars Benedict Cumberbatch as Sherlock Holmes and Martin Freeman as Dr John Watson in a 21st-century Setting Update of the original stories. The show has been a critical and commercial smash hit both in the UK and abroad and cleaned up at the 2011 BAFTAs, including wins for Best Supporting Actor (Freeman) and Best Drama Series. Elementary: The rival of BBC's Sherlock, featuring Holmes in a the USA instead of London and a genderbent Dr. Watson. The Canadian mystery series The Adventures of Shirley Holmes was about the great-grandniece of Sherlock Holmes solving crimes. House MD owes quite a bit to Sherlock Holmes. Besides the acknowledged parallels -- Greg House/Sherlock Holmes and James Wilson/John Watson -- there are a number of references and running jokes that pay homage to Sherlock Holmes, such as House's house number 221B (Baker Street), the name of the man in "No Reason" who shoots House, named as "Moriarty" in some documentation (although never onscreen), and the fact that the very first patient that he treats in the pilot episode is a woman named "Adler". Also, in the episode "Whac-a-Mole", House diagnoses the patient and seals his diagnosis in an envelope, with the words "The Game is a itchy foot." written on it. This is a blatant reference to Holmes. There was also a series of BBC radio adaptations starring Clive Merrison as Holmes. Merrison's performance has some marked similarities to Brett's; he is the only actor to have appeared in adaptations of all the original stories, as well as new pastiches. Big Finish, most famous for their extensive range of Doctor Who audio plays, have been producing a series of Sherlock Holmes dramas. There are four in the series so far: one is an adaptation of a canonical story, one is set during Holmes' elderly years after the passing of Dr. Watson, one is a metafictional tale in which Sir Arthur Conan Doyle and Professor Moriarty conspire against Holmes, and the most recent installment pits Holmes against Jack the Ripper. The Great Detective is played by Roger Llewellyn and Nicholas Briggs. Sherlock Holmes first appeared on-stage in a 1899 play written by and starring William Gillette. Simply titled Sherlock Holmes, it featured an original plot. Years later, Orson Welles would adapt the play for The Mercury Radio Theater with the explanation that, "It is not enough to say that William Gillette looks like Sherlock Holmes: Sherlock Holmes looks exactly like William Gillette." It was Gillette, and not Doyle, who popularized most of the visual tropes associated with the character to this day such as the deerstalker cap, the distinctive pipe and riding cloak. His iconic attire was originally depicted by Sidney Paget, who illustrated the stories for their initial publication in Strand Magazine, but he only put Holmes in them in appropriate situations: when the story took him out of London, and into the countryside. Starting in 1988, Jeremy Brett and his second Watson, Edward Hardwicke, starred in a stage production titled The Secret of Sherlock Holmes. It was written by Jeremy Paul, who scripted many episodes of the Granada Television series. Three Sherlock Holmes games were released on a Famicom, but none of them outside Japan. Two were your typical adventure games solving clues. The third one was an action-adventure game which wasn't received well. Sherlock Holmes: Consulting Detective, was released for PC, TurboDuo, CTDV and Sega CD in the early '90s, as part of the Full Motion Video craze that gripped gaming after the introduction of the CD-ROM format. One of the last Interactive Fiction games produced by Infocom was 1988's Sherlock: The Riddle of the Crown Jewels, in which the player takes the role of Watson. 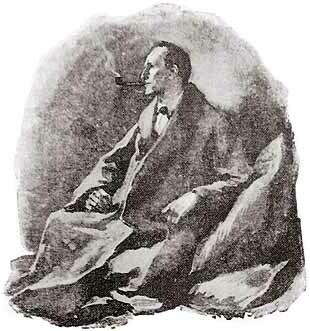 Electronic Arts' The Lost Files of Sherlock Holmes, sadly limited to two adventures (The Case of the Serrated Scalpel and The Case of the Rose Tattoo) were released in the 1990s, making use of the Literary Agent Hypothesis to portray two Holmes cases considered "too hot to show". ↑ The sole exception to this was between young women who were very close friends. This page was last edited on 23 September 2018, at 19:43.